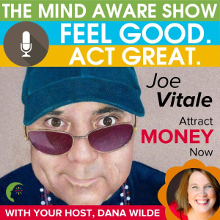 What We Talked About: The difference in the way Joe thinks now that he’s wealthy and well-known compared to when he was homeless and living in poverty and how each one of us can implement the same techniques to shift our own thinking. Why I Like Joe: Joe has such an easy, relaxed way about him. He’s playful and that makes it easy to learn from him and a great fit for this show. The other thing I like about his is that he’s willing to take the normal mindset topic to the outer edges and give some really cutting edge techniques that we don’t often get to play with. Great Line: You can have everything you want in your life if you’re willing to wake up.